Hi everyone! Instead of a giveaway this week, I wanted to do a fun freebie for all those awesome kindergarten students out there! It’s been a little while since I’ve added to my K4 curriculum, but I wanted to make a new set of Number Writing Worksheets to help Tinker Bell learn her number words, as well as practice number writing, and recognition. For the Number Writing Worksheets Vol. 2, I wanted more of a challenge for my kindergartner. 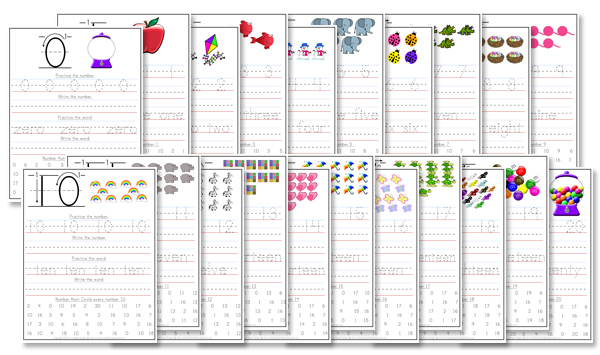 The download includes worksheets for numbers 0 (zero) through 20 (twenty). Here is an up-close of one of the worksheets. Each one includes number writing practice, then writing the number on your own, practicing the number word, writing the word on your own, and finally a number hunt for that number. How do I use the worksheets? You can choose to laminate these or slide them into a page protector, then have your student practice using a dry-erase marker. This makes them easily re-usable for those of you with multiple students. You can also just print and let them use a pencil or marker to practice their writing skills. For the number hunt, consider having them circle the numbers, color a dot over the number with a marker or crayon, highlight the number, use a do-a-dot marker to dab them, or cover them with cheerios for some variety! Another idea would be to have students cross off all of the numbers that are NOT the number they’re working on. If you haven’t seen my original K4 Number Writing pages, you can see a sample below. These include some pre-writing practice then a larger version of the number practice. As you can tell, there are dots and arrows to help students learn how to write their numbers, along with some fine-motor skill handwriting practice. I hope you enjoy the K4 Number Writing Worksheets Vol. 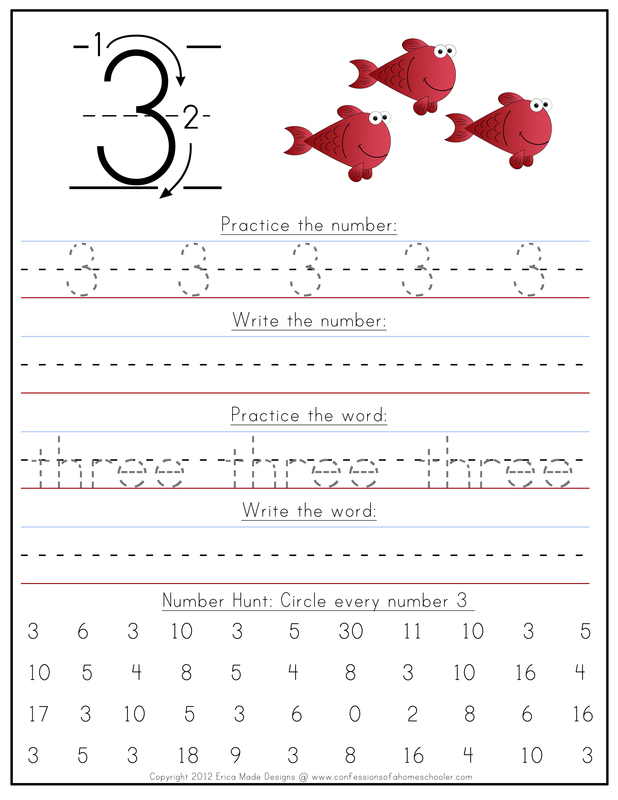 1 and K4 Number Writing Worksheets Vol. 2 and that your students have fun learning their numbers! These activities are part of my K4 Curriculum geared towards kindergartners. If you have a preschooler you might want to check out my Letter of the Week Curriculum, click on the images below to see more activities. Thank you! I’m looking forward to using these with my kindergartener! Thank you! I can’t wait to get these printed so my daughter can start doing them. Just what I needed today! Thank you! Thank you soooo much!!! My daughter and I were working on numbers Friday when I realized that she needed help with number recognition, instead of just assuming the next number from memory! You are awesome!! We are having the same issue. Love these! Thank you! This is a great way to wrap up Kindergarten for our daughter, thanks! Thank you so much! I love your site!! !